The Sunday bird walk was cancelled because of the wind and rain. Two Short-tailed Shearwaters were seen at the Little Qualicum River Estuary in Qualicum Beach. 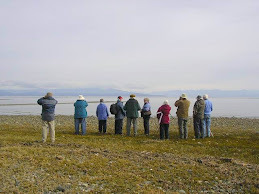 The Tuesday Bird Walk went to Deep Bay. The morning was mostly cloudy with light showers but we finished the morning in sunshine and blue skies! A large flock of Dunlin flew along the far shore. We spotted a Pie-billed Grebe just off shore. A Black-bellied Plover was seen resting on the gravel near the shoreline. 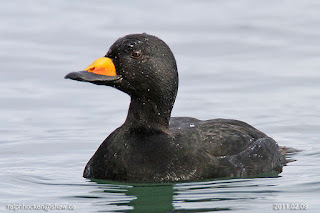 A Black Oystercatcher was spotted further along the shoreline. 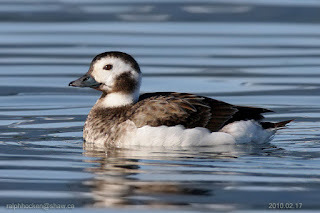 We saw eight Long-tailed Ducks in different plumages swimming and diving not twenty yards off shore giving us great views. A large flock of Greater Scaup, Harlequin Ducks, Surf Scoters, White-winged Scoters and Black Scoters were seen further off shore. The two surprise sightings of the morning were an Rufous Hummingbird and a Chipping Sparrow seen just off the trail at the point. Five hundred Dunlin and one Sanderling were seen resting on the gravel bar at the far end of Parksville Community Park in Parksville. A Palm Warbler and a Yellow-rumped Warbler were seen in the trees in the same area. The Tuesday Bird walk on January 23, 2018, will be going the Shelly Road side of the Englishman River Estuary in Parksville. Meet at the Parksville Community Park (at the parking lot in front of the Lions Club Playground) at 9:00 a.m. or at the end of Shelly Road (on the oceanside of highway 19A) at about 9:10 a.m. The Sunday walk on January 28, 2018, will be going to Bowen Park in Nanaimo. Meet at the Bird Store at 9:00 a.m. or at the main parking lot (near the lawn bowling greens) at Bowen Park off Bowen Road at about 9:15 a.m.